The author’s uncle, Hazem Elaydi, comforts his mother in the family’s home in Maghazi refugee camp. The date is 21 December 2011, a day that will live within me for the rest of my life. As I went through the Rafah crossing, my eyes scanned the faces of every man before me; I was searching for my uncle, Hazem Elaydi. I had not seen him in more than twenty years, since before he was illegally imprisoned by Israel during the first intifada. I traveled across the world to see him after his release during the prisoner exchange deal between Israel and Hamas in October. Every time I travel to Palestine, my first few days in my homeland are always filled with tears and covered by a cloud of disbelief. The sheer joy of being home makes me feel as if I’m in a dream, that I could not be so lucky as to return to my homeland yet again, and this last trip was no exception. I remember first seeing his smiling face. Even as I ran to his arms, I stared at his face trying to remember its details in case I really was dreaming and would soon wake up from this beautiful fantasy. As I hugged him, I tried to learn his scent, hoping that I could add this detail to the archive of my memory of him to draw on later when I was no longer near him. As we rode from Rafah to the old family home where my father, aunts and uncles were all born and raised in Maghazi refugee camp, I stared at him. I tried to learn the shape of his smile, the shades of black, brown and gray in his beard, the fine lines forming around his eyes, the depth of his voice and the innocent and child-like quality of his uniquely high-pitched laugh. When we arrived, we sat in the family room and I quickly stole the seat next to him. I held his hand and wondered what I could say to him to show him how happy I was to meet him. I wanted to be articulate, but he cannot understand my native tongue. I wanted to impress him without being obnoxious. I wanted him to know me and be proud of me but I was too intimidated to speak. Instead, I sat silent and tried to force myself to believe that I wasn’t dreaming. Everyone in my family asked me what I did when I first saw my uncle. Did I cry like my older brother? Did I pass out from shock like my cousin? My reaction included neither tears nor the loss of consciousness. Although it’s not as exciting a story, my reaction to seeing him came in small, nearly overwhelming doses of sudden awareness. That first day, when I was sitting in my father’s childhood home, reality slowly set in. Last year, I sat in this room as my family welcomed me back to Gaza after six years of being away. This time was different. This time was not about welcoming me home or asking me about Egypt or my brothers; this time I was sitting in this room to meet my uncle. The uncle I knew only from photos, stories and a few sporadic phone calls. Now I am in his presence. All those countless times I begged for his release in my prayers were fruitful. All those moments of anguish when my grandmother desperately cried for him have been offset by her joy of seeing him. I looked around and saw my 17-year-old cousin who was named after my uncle and met him for the first time two months ago. It was real. My uncle was among us and free and himself and unafraid and I was there with him. My eyes swelled with tears and I suppressed them. The time to cry had passed and now was a time for smiles and laughter, I told myself. I remember the first time I heard someone call out my uncle’s name to ask him a question. I don’t remember the question or who was asking, I just remember realizing that finally my uncle was near enough for us to merely call his name when we wanted to speak with him. I remember the first time someone made reference to “Hazem’s house.” Again, I cannot remember the context, but I can remember the overpowering joy I felt as awareness of the realness of his release set in. He has a house, I thought, his own house. This is not temporary; he’s here to stay. I’m not imagining this. I forced myself not to cry. I looked at my dear uncle and smiled; the moments I have with him are limited to the length of my visit and I will not spend them trying to convince myself of something it took me two weeks to come to terms with back in October. He is here and I will make the best of it. I tried to learn his personality, his sense of humor, the way he spoke to people, his mannerisms, and everything else that Skype conversations and phone calls can’t give away. I realized that he was very different from anyone I knew. 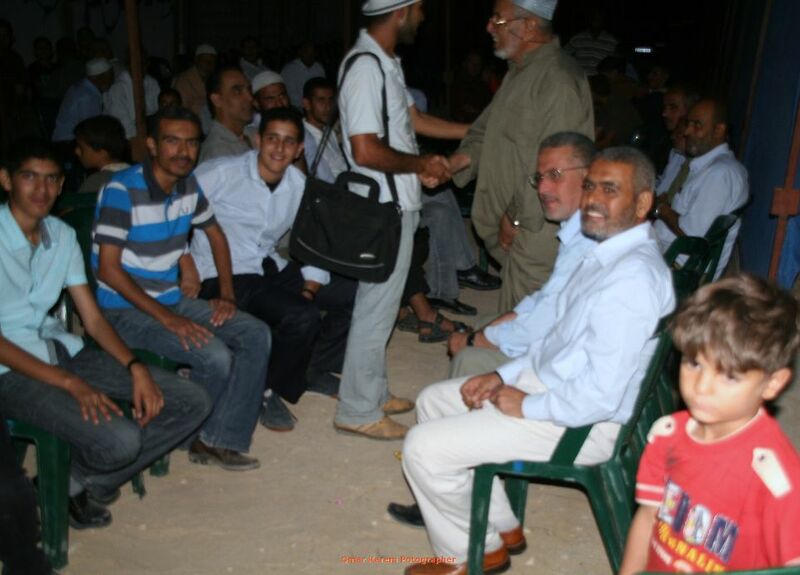 Unlike most people I knew in Gaza, he never interrupted anyone in conversation. He was respectful and patient and always paid very close attention when others spoke to him. Everyone who met him instantly trusted him. There was something about him; there was honesty in his eyes, thoughtfulness in his facial expression, wisdom in the curve of his brow. Something about him made me instantly feel like I could trust him with all of my secrets and feel like they were safer than before. He always gave humble advice in every context and topic of conversation, but he never preached. He offered the best solutions to every issue and cited where the wisdom of his advice came from. When we were invited to dinner at two places the same night, he was the one that resolved the issue. When my brothers’ haircuts were too wild for Gaza’s conservative culture, instead of staring and judging, he explained to them people’s reactions. When my cousins and I had a sudden desire to go to the beach in the middle of a winter afternoon, he took us and let us stay as long as we wanted. He is easy going and took everything in life in small doses. He was our tie to occupation and injustice before his release and now he is our anchor. My uncle’s release not only brought great joy to my family and reunited all of my aunts and uncles both in Gaza and the diaspora, but it also changed the dynamic of our family. It felt like a lot of the pettiness that often exists with large families seemed to disappear from ours for a while. My grandmother is more upbeat and focuses her attention on choosing for me a husband and sharing stories from a time when Palestine’s air was free and her trees more fruitful. The cousins we worried about have been tamed by the influence of a respected uncle. And finally, we no longer have to hang posters, photos and plaques bearing his face on our walls to feel his presence. My uncle Hazem is with us and we treasure him even more than before. I tried to learn who my uncle was and observe him so that when my ten-day opportunity to get to know him was over, I’d have plenty to draw on when I later tried to remember him. I memorized how much he adored his wife, how gentle and patient he was with his young nieces and nephews, how understanding he was with me and my older cousins, how accommodating and affectionate he was with his mother, and how contemplative he seemed in the moments he had to himself. As a Palestinian who only knows her homeland through short visits, the most difficult part of my trips home is leaving. This time was the worst. I avoided saying goodbye to my uncle for as long as I could. I made up excuses, came up with stories to share and favors to ask and staged family photos, but the impeding sorrow was unavoidable. As soon as my uncle released me from the last hug I was able to share with him, I felt instant remorse. Why did I go to bed so early when my family was having our evening gatherings? Why didn’t I sit with my uncle more? Why didn’t I say more when I was with him? Why didn’t we book a later flight? Do I really need to go back to school? Why didn’t I take an extra year off? What if I come back to Gaza in the summer? I realized that my trip had been too short and that I spent far too much of it eating and sleeping or sitting around waiting for electricity, an Internet connection, or bath water to heat up. In the end, I was grateful for the beautiful opportunity to get to know my uncle and his incredible wife and to see the way my family had changed with his presence. Now, I look forward to my next opportunity to see my uncle. Oddly, this experience has led me to wonder about the moment I will meet another Palestinian that I have heard stories about my entire life and have a deep attachment to but have never met: my Palestinian hometown of Bir al-Saba. Many refugees in the diaspora have grown so accustomed to their lives outside of their hometowns that they no longer identify with their ancestral villages and towns. My uncle’s release has taught me that nothing is too far out of our reach. My imagination was never creative enough to piece together an alternate reality where my uncle Hazem was no longer a prisoner. Even with my hopelessness, this miracle occurred. When I try to picture Bir al-Saba, I see images of Maghazi Camp, the Sinai Desert and photos of Bedouins I’ve seen in books and online. Now when I remember meeting my uncle, I think about my coming encounter with Bir al-Saba and learning her history, roads, buildings, schools, wells and her market. I think about memorizing her scent and her landscape; the colors in her sunsets; how dark it must get before the first stars begin to appear in her sky; and how warmly she will welcome me and her other estranged children. Even though the right of return seems far-fetched to so many refugees, meeting my uncle has reinvigorated my belief in this right. His release is proof that the victims of injustice should never lose hope because history and experience have proven that all types of oppression eventually come to an end. Like I said before, I always tied the release of my uncle to the freedom of Palestine and to our return to our hometown and, after meeting him and experiencing the miracle of his release, I believe this even more strongly. Fidaa Elaydi is a Palestinian boycott, divestment and sanctions (BDS) activist and law student. She is visiting Gaza to meet her uncle, a political prisoner who was released in the October 2011 prisoner exchange deal between Israel and Hamas. She is a third-generation refugee who strongly believes in the right of return. Meeting My Uncle After 20 Years in Israel Jail was an experience many felt in Palestine, after this historic deal took place in Egypt between Hamas and Israel. One Israel Soldier was exchanged for 1027 Political Palestinian Prisoners, including 27 women and 14 children. The Euphoria started spreading around the world when the news broke out that our Palestinians heroes will be coming home. 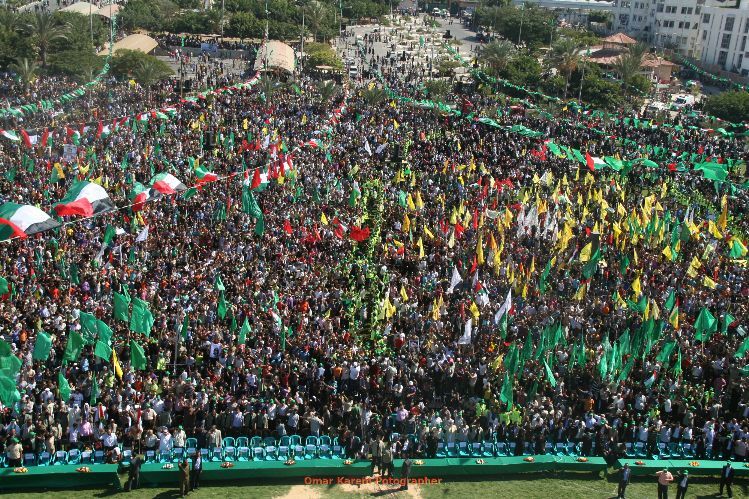 Since early in the morning on this day October 18, 2011 thousands of people started gathering in different parts of Palestine to welcome The Heroes coming home. The Red Cross was preparing the buses that have to be used to transport hundreds of Palestinians to 3 different spots in Palestine, Rafah Gaza Border to be officialy received by Haniyeh, Twenty-two female and 96 male prisoners are to pass through Beituniya on their way to Ramallah, where they will meet Palestinian Authority President Mahmoud Abbas. Rafah Egypt, Khaled Meshaal the leader of Hamas in Damascus will be arriving in Cairo where 40 Palestinians will be welcome by him, as the first step to find their next home, there are 3 countries already confirmed to take some of them into exile; Turkey was confirmed yesterday, Qatar and Syria the other two countries.